Artwork details: gouache, 5 x 5 inches (13 x 13 cm), 2005. This is the Bank Holiday fairy. It's she we have to thank for the great British Bank Holiday weather. 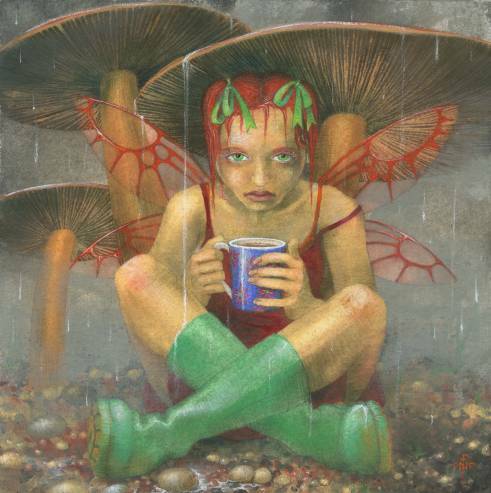 Don't you believe that pathetic sulky look, the soggy flimsy summer dress teamed with muddy wellies, and the way she clings to her warming cup of tea, sheltering there, oh-so innocently under her toadstool. It's all her fault, really. Someone jilted her on a bank holiday you see, and she's going to make dam sure no-one else has a good time, ever again. And she has particularly good hearing, too... she can hear the words "Isn't it a nice day? ", and "I hope it will stay like this for the weekend" from a hundred miles away.